Trendy Tequila Flavoured strong Lager actually brewed in France. Now I\'m not normally a lager drinker however I gave this a go on a hot summers day on recommendation from the pub landlord and I have to say it was the most refreshing lager I have ever tasted. I didn\'t find it at all gassy and this non lager drinker has been converted! I would recommend this to anyone, however be aware of its strength as at 5.9% its a bit much if you not a big drinker. I'm afraid that I must disagree with the otherwise very discerning customers of this website. Generally I love Mexican lagers, especially with a wedge of lime in the neck(ice cold sol being my favourite)I found this beer to be a little too gassy and sweet with a distinctly chemical after-taste. I'm not convinced that it is real tequila in there but more likely grain alcohol a la alcopops. Stick to sol or Cypriot beer for a BBQ drink - they are more refreshing and generally better beer. Truly wonderful bier, first found in bars in Brussels but drank much more of it in Basel Switzerland,may not be to taste of everyone but served chilled with slice of lime and it is tremendous,so happy i have found it here as so hard to find in UK and when you do very expensive. Keep up the great service. 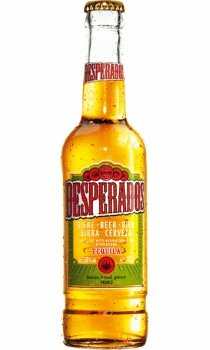 When I first discovered Desperados in a French supermarker, I was expecting it to be horrible but curiosity got the better of me and I bought a couple of bottles...let's just say I was very pleasantly surprised and had to go back the next day for more! This is one of the nicest lagers I've tasted; absolutely perfect for hot summer night barbecues. I've found it pretty hard to get hold of in the UK, so very pleased to find it available here. Surprising... I actually quite like this! One for the house party, not a beer you would sit down with and savour just one. Quite sweet, but gets you to that 'warm and fuzzy' place for which it is designed. This beer is the tops, sweet, refreshing and just great after a hard days work. Hits like a mule! It has a sweet taste, it is mostly drunk with a wedge of lime that complements and intensifies the flavour through the palate.